Everyone loves a great meal. It's the last few days before Santa arrives and we're all pressed for a few extra minutes or two. During my productive many hours on Twitter, I happened upon a conversation about favorite meals for DHs (Dear Husbands). (Why I jumped in the convo without a husband is beyond me - but I digress). One of my friendly followers mentioned chicken spaghetti. I've engaged in a few conversations about chicken spaghetti, so I decided to try it. My grocery shopping extravaganza is typically on Sundays. I added the items necessary for the meal and prayed to the Food Gods that all would be swell. The recipe and directions are below. My picture and review will follow. Well, I followed the recipe almost. I used a bit too much cheese and used Pepper Jack instead of Cheddar. I also used Rotel because that's what my Twitter Follower said to do. It was a pretty quick meal but I did not like it. It may be something children would enjoy but eh, iCant. By no means is this massive fail anyone's fault (especially not mine) . I'm not much of a cook though I make great Thanksgiving food. I'll keep practicing though. I'm sure my future husband will want a home cooked meal sometimes. My version is below. (Be nice) Excuse those Thanksgiving rolls and yes they were as hard as they looked. 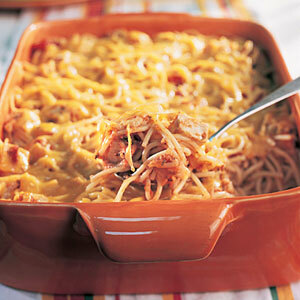 Have you guys ever made chicken spaghetti? Is this something that your guy would enjoy? 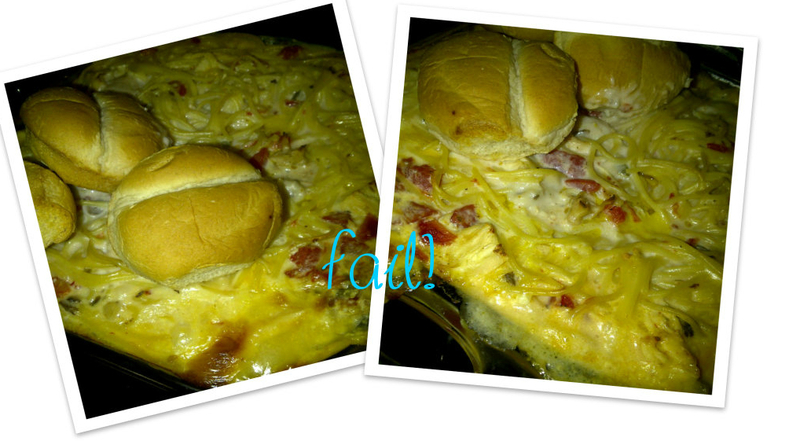 Never made it but looks yummy,,.been thinking of recipes where I can get a few meals out of it so this is perfect! It looks pretty good!! I've never made it before but I do love it!! I need to try my hand at it as well. My guy and I have been together three years and I've learned to cook pretty good since I practice for him. My go to website is allrecipes.com since people actually review the recipes and tell if they did mofications to it. Fortunately his mother can't cook so even my epic fail recipes he ends up liking lollllll make sure ur future hubby's mom can't cook!!! @Mrs. Pancakes - girl I'on know about this one. It's quite cheesy. @Style4Curves. LOL Another great tip on marriage. LOL! I actually have eaten chicken spaghetti. I've never made it but it was a regular meal my Mom would make way back in the day. I honestly thought it was a hispanic thing since all of my Puerto Rican friends have had it and some still make it. It's ok, different. My hubby I'm sure would not care for it. I think it's an aquired taste. Ha! I have heard of chicken spaghetti but I have never made it. Seems like a pretty straight forward recipe. Too bad you didn't like it. Keep at it though! I've had chicken and spaghetti, but never combined! Great post and recipe thanks for sharing. My hubby doesn't like spaghetti so wouldn't make it lol,I have tried it before&loved chicken pasta.loves his home cooked food throughout e week but hav2substitute pasta w somethn else. That can be tricky! Because you don't want to dry out the chicken or spaghetti. I make a chicken tetrazzini, and the key is to add milk. I know it sounds crazy but it keeps it moist and is very delicious. I have yet to enjoy Chicken Spaghetti, but I imagine I would. I love chicken and I love spaghetti, so I'm sure I'd love the combined dish. hilarious!! What can I say it sounded good like it would be good. LOL! I amke Chicken Spaghetti but I make mine in a pot. Quick and easy and done. You have no idea how good this sounds to me right now! I've never had chicken and spaghetti, but it looks like a dish I would enjoy! Keep at it though! Isn't it fun to try new recipes?! This one was rough. I may try it again in the spring or so. I only ate two servings. Happy holidays and New Year to each of you. My friend's Mom makes it and it's pretty good!